NYC is Blue: Fansided: "NYCFC Will Become American Arsenal"
Fansided: "NYCFC Will Become American Arsenal"
Fansided's Arsenal blog Pain in the Arsenal has an interesting take on the Vieira hire. Patrick Vieira has crossed the big Atlantic pond to assume the duties of manager of New York City Football Club. NYCFC is loaded with talent and they were a major disappointment to have missed the MLS playoffs. With the likes of Frank Lampard, Andrea Pirlo and David Villa, a little time may solve everything. But so, too, could a new look. 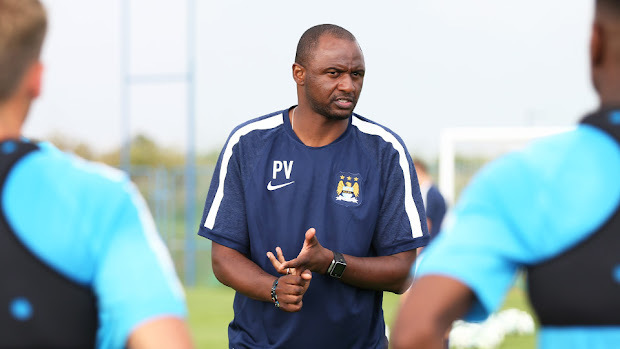 Patrick Vieira has been working within the Manchester City system since he retired from football. He is staying in that system by moving to their sister club, NYCFC. But that does not mean that Vieira has turned baby blue on us. “I think the one who really inspired me was Arsene Wenger because of the number years I spent with him at Arsenal,” Patrick Vieira said, as quoted by InsideFutbol. While we don’t want to read into his statements too much, it is rather obvious that in terms of coaching, we are going to see a lot of Arsene Wenger coming out in Patrick Vieira. That is who Vieira played over 400 matches for. That style of play and management is built into his internal wiring. But it is a successful style of play and management. NYCFC has the tools to enact a similar style. They have the pass master in Andrea Pirlo. They have the running striker in David Villa, they have plenty of wild card attackers like Poku and Khiry Shelton. The midfield is bolstered by Frank Lampard. This is a team with quality, they just need unity and a direction. And a defense. But that is a topic for another blog. No one brings out a spirit of team unity like Arsene Wenger. Good thing his protege will be taking over a team in need of unity. Patrick Vieira was the heart and spine of Arsenal’s Invincible squad that went on to find so much success. He has been in the trenches as the team captain, knowing full well what has to be done to establish consistent success. He witnessed it for nine years and he is still seeing it today. Arsenal is what prolonged success looks like. 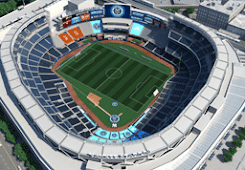 That is the kind of thing that Patrick Vieira is going to try to build for NYCFC. They have the foundation, as mentioned. They have youth, experience and flare. Patrick Vieira can bring that unity out of them and build a lasting legacy at the club. There is no one better to model something like that after than Arsene Wenger. Patrick Vieira also cited inspirations like Jose Mourinho and Fabio Capello, but the predominant voice in his head is going to be the deep, French-accented, Terminator-like voice of Arsene Wenger. And that is going to benefit NYCFC immensely. Although, he better do it soon because once Arsene Wenger retires, Arsenal is stealing Patrick Vieira back to the Emirates. He's pretty bullish on NYCFC's upside; I'm a little more skeptical. But if Vieira can do anything like this in New York, it's going to be amazing to watch. From the Factory Floor: "Until Next Year"
Where Have We Seen That Badge Before?